Elder care requires an intergenerational partnership. The duty to care for an aging parent is often grounded in an understanding of reciprocity; the parental hands that once held ours during childhood now require our supportive presence in old age or during an illness. How does this caregiving expectation of reciprocity apply to the approximately 76 million Baby Boomers in the United States whose aging will dominate the next few decades? The Baby Boomers’ high rates of divorce, remarriage, single parenthood, decreased birthrate, and their geographic mobility signal profound changes in the traditional elder care script. More than 40% of adults in America include a step-relative in their family. Many Baby Boomers now count grown stepchildren as a part of their families that they did not care for, let alone know, during the stepchildren’s childhood. Elder care can no longer be based on a presumption of generational reciprocity. And yet, family caregiving, in contrast to paid professional care, remains the backbone of our society’s approach to caring for its aging elders, especially those with chronic or terminal illness. To learn more about the experiences of today’s caregivers, we interviewed respondents aged 28 to 49 years old who had played an integral role in caring for their now deceased parent or stepparent. Our sample reflected current Baby Boomer family demographics: one-third of the parents were still married to their first spouse at the time of their death, one-third were single parents (many as a result of divorce), and one-third had separated from their first spouse or partner and remarried since having kids. Kendra, one of our respondents, is one face of the new normal in family elder care. She was the primary caregiver for her ex-stepfather in his final months. Throughout her life, Kendra has known several stepfathers, but she recalled that she and Jimmy just clicked. They stayed in touch even after he and her mother divorced. They both enjoyed working outside and fixing up the house together. When she was in between jobs, he helped support her financially and connected her to his professional network. Kendra prided herself on her reliability and loyalty. As her ex-stepfather faced decisions about downsizing and moving to an assisted living center, she helped fix up his house to ready it for sale. She explained that she “was the one who showed up when called.” Her presence created some conflict with her three stepsisters, especially when they decided not to come to the assisted living center the night Jimmy died. The parental hands that once held ours during childhood now require our supportive presence in old age or during an illness. Understandable. The grown child understood the implicit and explicit rules and expectations of his or her family system. If the parent became incapacitated or died the interviewee understood the values and wishes of the parent figures. Manageable. The grown child felt a sense of control within the caregiving, medical decision-making, and funeral planning process. The grown child was able to contribute money, time, effort, or emotional support during the experience. Meaningful. The grown child felt that providing care was worthwhile. They incorporated the experience of support and loss into their sense of self and their family story. An expectation of ongoing relationship. The family members, narrowly or broadly defined, remain in contact a year after the death. in remarried families, the ability of the grown child to empathize with the parent’s spouse or significant other and see the surviving stepparent through the eyes of the parent and value that stepparent as a human being. Kendra brought to the interview a stuffed bear the hospice volunteers had made for her from Jimmy’s shirts. With tears in her eyes she confessed, “I considered him my dad.” She tried to stay connected to her stepsisters in the year since his death, but her attempts were largely one-sided. Hence, she grieved both him and them. As Kendra’s story shows, although caregiving continues, changing family structures change the caregiving–and caring–experience. Featured image credit: The Beauty of Old Age by Vinoth Chandar. CC-BY-2.0 via Flickr. Amy Ziettlow is ordained in the mainline Evangelical Lutheran Church of America and serves as pastor of Holy Cross Lutheran Church in Decatur, IL. Naomi Cahn is the Harold H. Greene Professor of Law at George Washington University Law School. 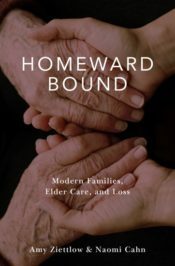 They are the co-authors of the forthcoming book, Homeward Bound: Modern Families, Elder Care, & Loss (Oxford University Press 2017). Interesting. I would say it never has been. It may appear to be the case, because we have a deeply skewed understanding of “care”. But elder care, in a significant minority of homes (at least in America), has always been based on an obligation grounded in guilt, not genuine reciprocity. Many parents do as much harm to their children, as they do good. Yet, those same children remain committed to the care of their elders well into their own adulthoods, even at the expense of their own flourishing. And there are numerous excuses we give for this, out of sheer conditioned reflex: “They did their best”, “it was a different time then”, “I was a difficult child”, “that was the past, its different now”, “children are resilient”, and on and on and on. All you’re suggesting now, is that we extend this regime of guilt to everyone, by institutionalizing it. Millennial caregivers make up nearly a quarter of the 43.5 million caregivers today. It has its positive effects, but it can also cause significant blows in people’s lives if they are not careful. The cost of taking care of a loved one might take a financial toll on you and affect your retirement negatively.